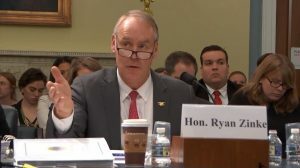 The Secretary of the Interior, Ryan Zinke, is “demanding” more of his department’s employees as they tackle streamlining environmental analyses and reorganizing the department’s management areas, according to Christian Reece of Colorado’s Club 20. Reece, Executive Director of Club 20, gave Western Wire exclusive insight into the invitation-only, no-media event hosted by her organization in conjunction with the Interior Department last week in Grand Junction, Colo.
Moving the Bureau of Land Management’s headquarters to the West was a frequent topic, Reece said, though the DOI officials in attendance remained non-specific, as the vetting process for a move of as-yet-unknown size and scale remains ongoing. Reece said that in her opinion, the office will be moved, and the only question remaining is where. In addition to Grand Junction, Colo. as a possible site, Reece suggested that Boise, Idaho may be among the potential contenders. “As long as it’s not in D.C., we are okay with that,” Reece said with a laugh. 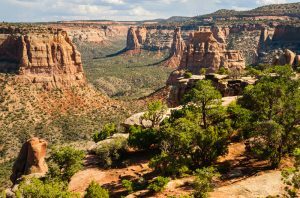 Reece said that Colorado’s Western Slope, and Grand Junction in particular, make an attractive candidate for the move, based on Secretary Ryan Zinke’s suggestions that a potential headquarters have strong quality of life, affordability, and employee attractiveness. “So the quality of life piece is, I think, the easiest for us to sell,” Reece continued. Potential collaboration with Colorado Mesa University to train students specifically for BLM or any public land management capacity would be an added capacity, according to Reece. It all comes down to bringing the department and the agencies and agency leaders themselves to the local level. Reece said that in her experience, previous efforts to include local voices has been more of a check-the-box approach that was more for appearance than for actual input. Beyond relocation, DOI reorganization was the prime focus of the meeting. Susan Combs, tapped by Zinke to head the department’s reorganization efforts, is the Senior Advisor to Zinke and is acting Assistant Secretary for Fish and Wildlife and Parks. Combs provided an update on the DOI internal reorganization and management regions. Reece told Western Wire that Combs’ presentation focused on the 60+ management regions under the Interior Department authority, from Fish and Wildlife to Office of Surface Mining and the Bureau of Indian Affairs, among others. That individual would coordinate interagency efforts within DOI for that region, Reece said. By communicating early and sharing information, environmental analyses and permitting would be enhanced, for example. 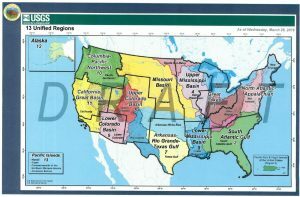 Consolidating the regions under the leadership of the Interior Department but allowing existing state offices and managers to remain is a compromise welcomed by Club 20 and by groups like the Western Governors’ Association, which had expressed concerns about moving to a watershed-based map of regional management that divided states. Earlier this year, Gov. John Hickenlooper (D) had welcomed the revised map from DOI that left most states intact, echoing the concerns of his fellow western governors who embraced reorganization but wanted the effort to be more effective. The earlier draft map had divided Colorado into three separate regions. Reforming the National Environmental Policy Act was a key discussion at the meeting, Reece said. DOI’s efforts to streamline NEPA under Secretarial Order 3355 are intended to provide relief for communities and projects experiencing delays that last years. NEPA studies should be completed in one year and should not exceed 100 pages, Tim Williams, Deputy Director of the Office of Intergovernmental and External Affairs for DOI, told those in attendance. Critics of NEPA’s expanding mission creep, costly litigation, and protracted permitting waits that commonly last more than half a decade have said the environmental law has become “weaponized” by activists opposed to development of any kind, unnecessarily delaying even vital infrastructure projects. Reece said the reaction among those in attendance—a bipartisan mix of Democrats and Republicans—was enthusiastic, tempered only by concerns about a one-year environmental analysis cap limiting public input. Reece said the DOI staff presenting did not believe there to be much of a concern, and instead were more interested in dealing with efforts to stall or block projects. But fully vetting projects of all types should not last as long as a decade, according to an oil and gas industry representative. The streamlining isn’t a shortcut, but really a way of holding Interior employees in all agencies to a higher standard, Reece told Western Wire. “The Secretary is demanding more out of our BLM and DOI employees,” Reece said. Reece estimated 80 people attended the DOI reorganization seminar at Colorado Mesa University, with a cross-section of elected officials, business leaders, and local residents. The event was hosted by Club 20, an organization of 22 counties and communities, business leaders, and other members for marketing and public education on Colorado’s Western Slope.